is due to iron chlorosis. 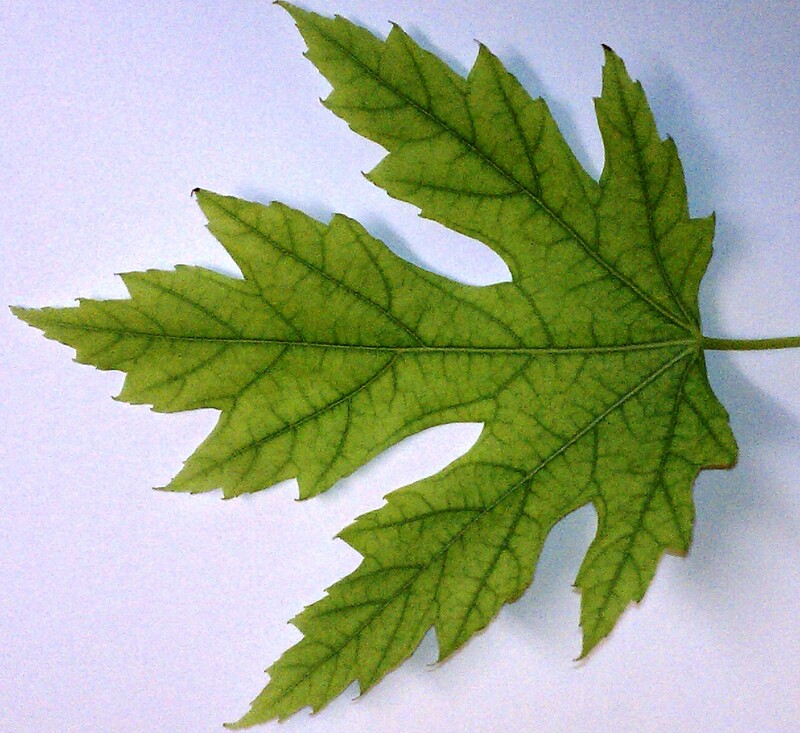 Symptoms of iron chlorosis include leaves with green leaf veins while the leaf tissue is yellow-green. Iron chlorosis is common in several of the towns in Clay County due to higher pH soils (more basic soils) which makes the iron unavailable to the plants. Trees can be injected with iron sulfate in the base of the trunk with the amount injected dependent on the diameter of the tree. There’s also another method of soil injection with micronutrients that can also be used. I also have a list of tree care providers for the area for trunk injections; please contact the Extension Office if you’re interested in obtaining this list. On evergreen trees, spruces losing their new growth or inside needles may be doing so due to two different fungal diseases or spidermites. If you are noticing this problem on your spruces, the time to prevent fungal diseases will be May next year with products such as Bravo, Daconil, or copper-sulfate based products. Spidermites can be managed with insecticidal soap. Ponderosa, Austrian, and Scotch pine trees with brown fungal bands on needles causing the needles to turn brown can be sprayed with a copper-sulfate based product now to help prevent further browning. If large branches of your trees have needles dying, the culprit may actually be the pine wood nematode which causes pine wilt disease in Scotch pines. There is no cure for that disease. To determine if pine wilt is the problem, cut a piece of dead/dying branch that is at least 1 inch in diameter and 4 inches long and send it to the UNL Plant and Pest Diagnostic Lab for diagnosis. 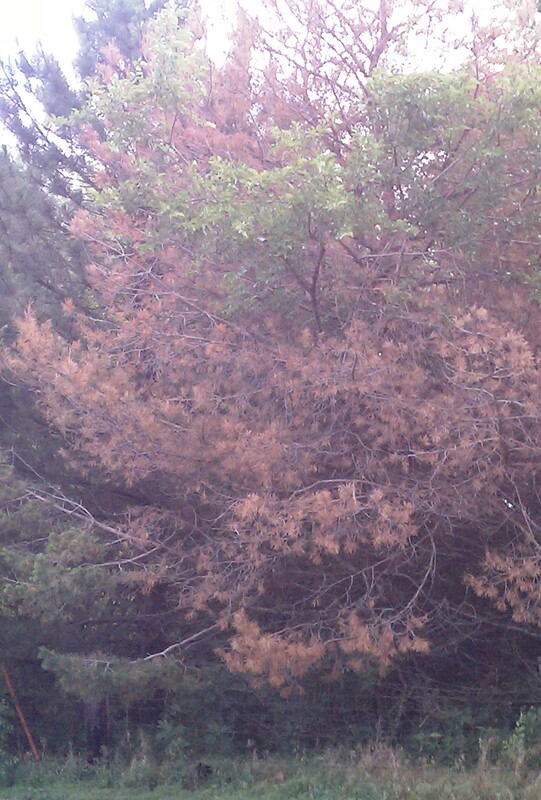 Cedar trees are also showing Cercospora blight right now with needles turning brown. We used to think nothing would kill a cedar tree, yet many cedar windbreaks have needles turning brown and this fungal disease is killing needles due to restricted air flow and high humidity within our windbreaks. Restricted air flow is something you’d like with windbreaks but many of the trees in windbreaks were planted too close together many years ago and we’re starting to see more of a problem with various fungal diseases. Another option to spraying fungicides is to consider removing every other tree from the windbreaks to allow for more air circulation to cut back on fungal diseases. If you’re unsure how to tell what kind of evergreen tree you have, cedar trees have needles like ropes. Spruce needles are single and when you roll them in your fingers, they have edges to them. Fir needles are also single and when you roll them in your fingers, they don’t roll easily like spruce needles because they are flat (flat fir). Pine needles are always in groups-of 2, 3, or 5. Austrian and Ponderosa pines have the very long needles; Austrians will always have long needles in groups of 2 but Ponderosa’s will have long needles in groups of 2 or 3 (If you ever see 3 needles, it’s a Ponderosa pine!). Scotch pines always have short needles in groups of 2. White pines have needles in groups of 5. 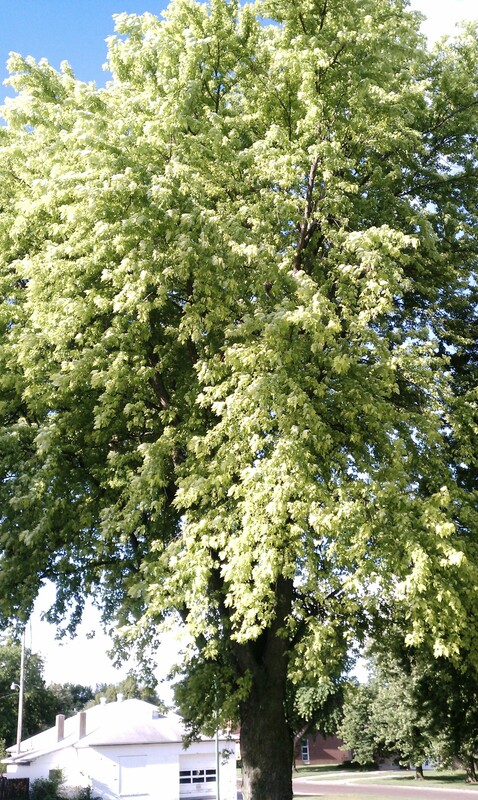 Posted on June 27, 2011, in Horticulture, Trees and tagged Diseases, Evergreens, Horticulture, Iron Chlorosis, Maples, Nebraska, Needle Blights, Pine Wilt, problems, Trees. Bookmark the permalink. Leave a comment.